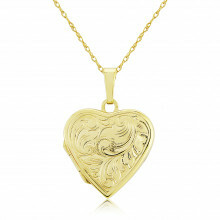 Echoing the design style of times gone by, this classic heart shaped Locket features a swirling decorative motif. Beautiful and meaningful, a Locket is a precious, treasured gift: a picture frame, a memento and a symbol of personal, individual remembrance. The reverse of the Locket has a smooth satin finish and is strung onto a fine Prince of Wales chain.